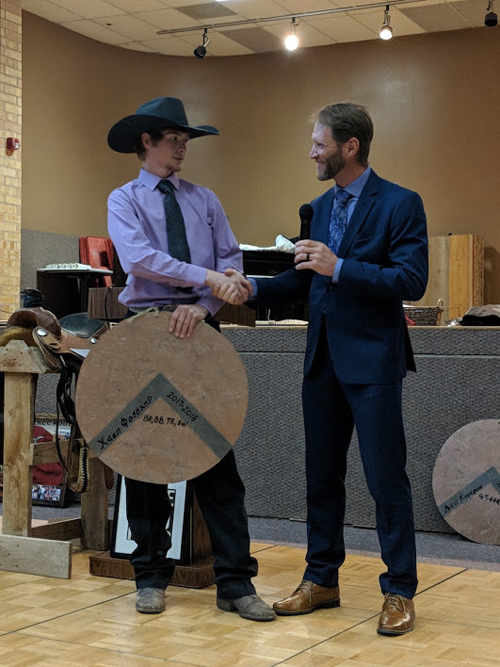 RANGELY | CNCC Rodeo celebrated their 2017-2018 season Saturday night at their seventh annual Spurs and Sparkles awards banquet. Morgan Crouse and Spartan cowboy Ethan Cook of Fruita provided outstanding live music while a few faculty members, parents and athletes enjoyed a top notch barbecue meal. 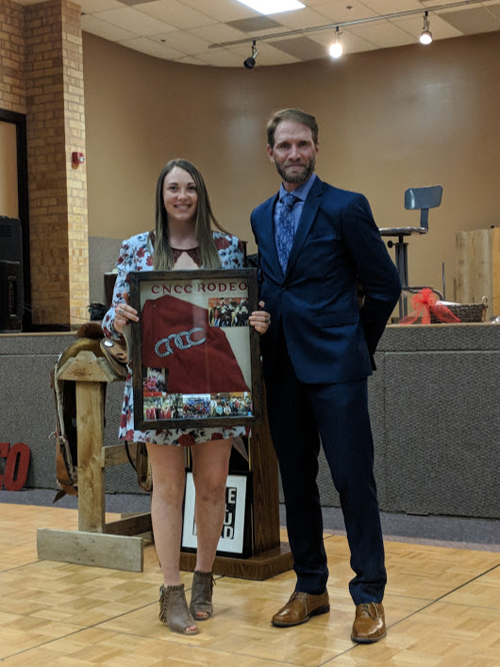 The traditional banquet dress code is “no blue denim.” Following a moving keynote by former CNCC faculty member Jessica Hearns, 18 rodeo athletes were honored by CNCC rodeo coach Jed Moore. Hearns, who had been a mathematics instructor and is now working for the National Park Service at Death Valley National Park, spoke of her very positive experiences with rodeo athletes as students, their ability to take on challenges and reach out to other, often younger, students. Freshman athletes were presented their Spartan shields while graduating sophomores received their Spartan spears. The awards, the wooden shields and spears, present the names of the athlete in Greek as well as the initials of the events in which they competed. 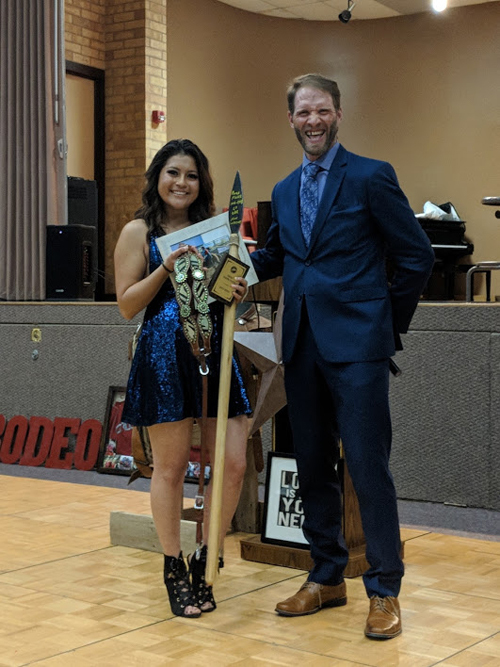 Ashley Farrington of Collbran received the women’s rodeo athlete of the year award for her contributions in the arena and in the classroom. 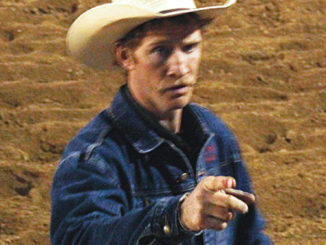 The men’s rodeo athlete of the year was freshman Wyatt Hallam from Mountain View, Wyo. 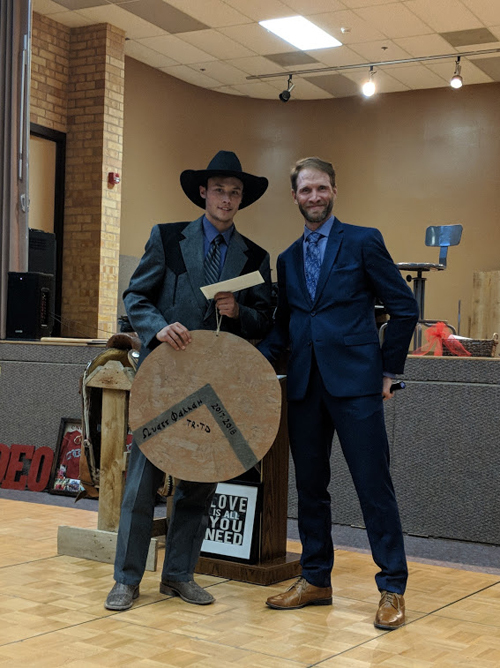 Most improved cowgirl and cowboy were sophomore Paige Miller from Granby and freshman Chase Vossler from Carpenter, Wyo. 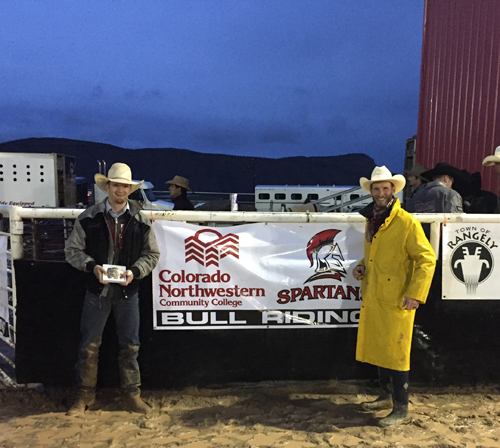 Bull rider Brandon Olson from Franktown was honored as the Spartan’s lone qualifier for the College National Finals Rodeo to be held in Casper, Wyo., June 9-16. Letter: Can a woman win the third congressional district? RANGELY I CNCC Rodeo Coach Jed Moore had a smile on his face following the College National Finals in Casper, Wyo., this past weekend.